… born in 1988, he is president of the Austrian Moth Class Association (AMC) and secretary of the International Moth Class Association (IMCA). 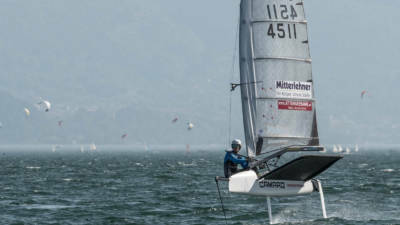 Together with his bowman, Philipp Rakuschan, he is multiple Austrian national champion title holder in the Tornado class (2007, 2009, 2010, 2012, 2013) and Upper Austrian national champion (2006, 2009, 2010, 2012). 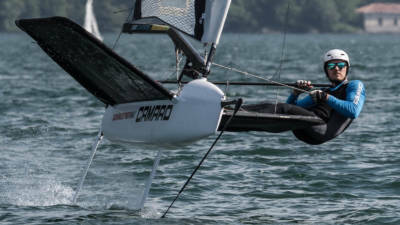 He finished sixth at the Euro 2012 on Lake Como and eighth at the World Championships 2013 in Ibiza. He topped the Austrian Moth rankings in 2014 and 2015, came fourth in the overal Moth Euro Cup 2015 rankings and second in 2016. In his “day job”, he holds a managerial position as constructional at Schönleitner Bau GmbH in Thern/St. Georgen and is project developer at Attergauer Wohnbau GmbH. 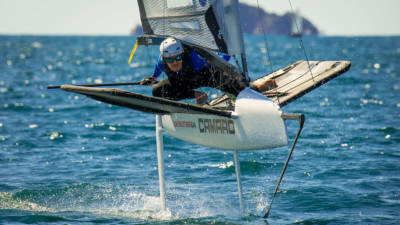 … has been around since 1928 and is considered to be amongst the sailing sector’s most innovative models. The latest model is the result of marrying two types and is now considered to be amongst the sailing sector’s most innovative models. The motto of its diehard fanbase, “Stick to the rules, but do everything possible to make you fast“, is only constrained by standardised limits: 3.35 m maximum boat length, 2,25 m maximum width and a sail area of 8 m². Material innovations such as carbon fibre and sandwich design, etc. make the Moth the most innovative model amongst lightweight sailing classes, weighing only 30 kg when fully rigged! Recent years have seen the Moth literally take flight with the advent of lifting hydrofoils on daggerboard and rudder, which lift the entire hull and skipper above the water surface, dramatically reducing drag and increasing speed. Even in light to moderate winds, the Moth reaches speeds of around 20 knots/ca. 37 km/h, and over 30 knots/ca. 56 km/h in high winds.